Mercedes-Benz plans to launch a new C-Class Coupe to replace its CLC Sportcoupe model sold overseas and partially fill the gap left by the CLK, which itself has become the new E-Class Coupe.The information was confirmed by Peter Schabert, the chief of the Mercedes-Benz plant in Bremen, Germany where the current C-Class is built. "The decision by the board of management to produce the Coupe version of the current C-Class here in Bremen as well represents another important milestone on our way to becoming Mercedes’ competence center for the C-Class and is a clear sign of the trust in the Bremen team's capabilities and standards," Schabert revealed in an official statement. 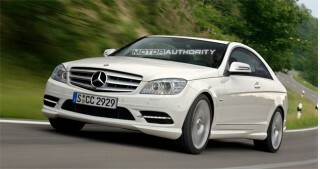 The new 2011 Mercedes-Benz C-Class Coupe is expected to join the rest of the facelifted C-Class range early next year. The car will feature a unique body and styling to set it apart from its Sedan sibling, however, all engines will be shared across the range and there could even be a high-performance AMG version complete with the company’s new twin-turbocharged 5.5-liter V-8.